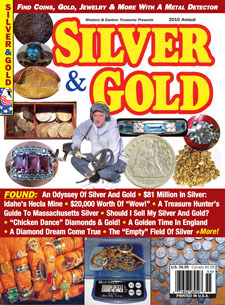 Special Edition, Articles Include: An Odyssey Of Silver & Gold - $81 Million In Silver: Idaho's Hecla Mine - A Treasure Hunter's Guide To Massachusetts Silver - Testing White's GMZ Gold Detector - Should I Sell My Silver & Gold - "Chicken Dance" Diamonds & Gold - A Diamond Dream Come True - A Golden Time In England - $20,000 Worth Of "Wow"! - The Empty Field Of Silver - Tourmalines, Diamonds, And Gold... Oh My! - Return To Pirate's Beach - The Effort To Get Some Gold - Written In Silver & Gold - Duck Pond Platinum... more!